Want to start building an e-commerce site? 5 tips to help you setup your shop! 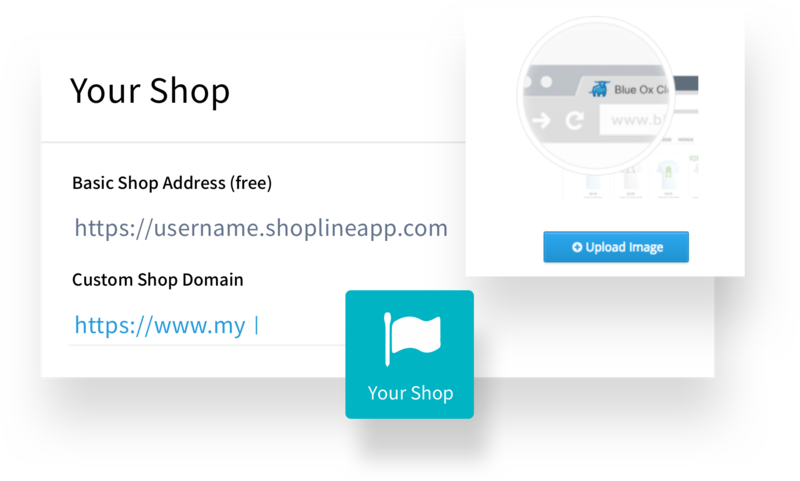 In SHOPLINE admin panel > My Brand, you can apply for your custom domain which gives your shop its unique identity and credibility. You will get full view of the website traffic which gives greater control on your business. Then, you can upload your Logo and Favicon, so that your customers are able to see the shop’s logo on all pages, allowing them to have a strong lasting impression after seeing it! All shops will get a free custom domain which helps the brand to develop awareness online. We also provide free domain transfer service. We do all the admin work for you, so you don’t need to start from scratch again. In SHOPLINE admin panel > Shop Design, you can pick any theme, background and layout that fit your products’ image and branding. After deciding the style of your store, you can start to create more pages. In SHOPLINE admin panel > Pages, edit and create unlimited website pages. You can add pictures, videos, QR Code, Facebook Page and other widgets easily by just drag-and-drop. Wisely use our modules to create your unique shop with outstanding style, enhancing customers’ trust in your brand! 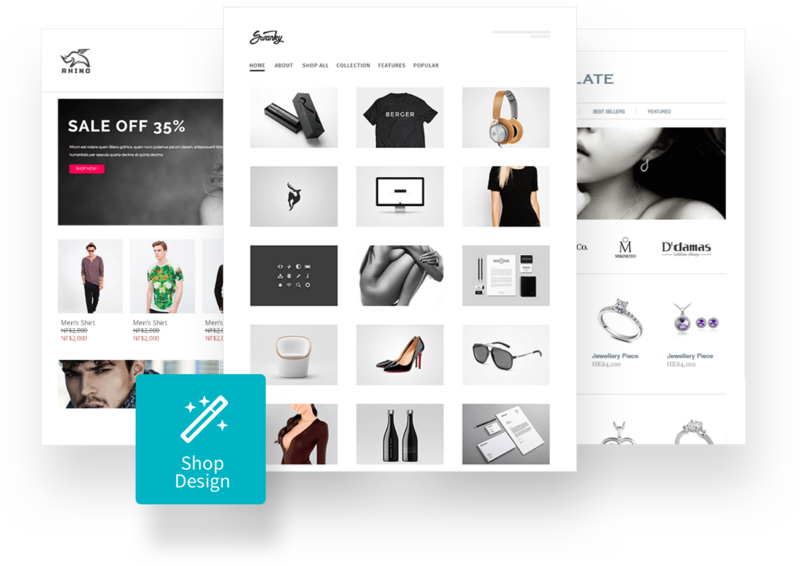 We offer 20 different themes with 10 shop widgets that help you to set up your shop easily and quickly. SHOPLINE provides you with SEO options for you to optimise search results. Handy delivery options can raise customer satisfaction and increase sales. 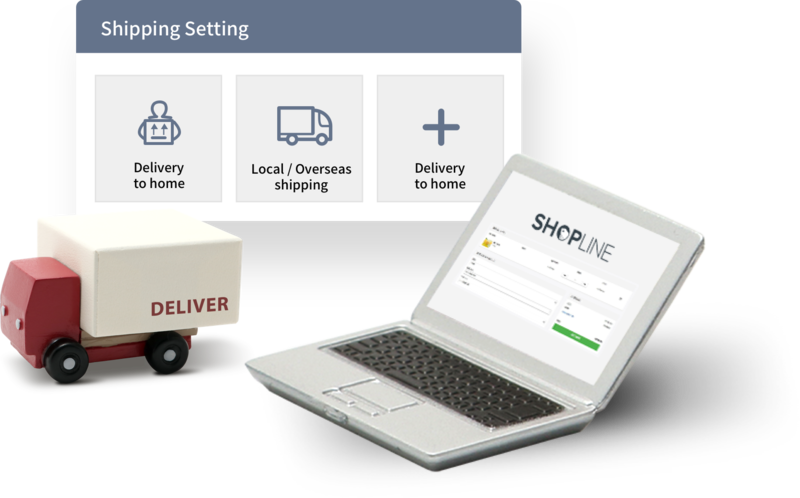 Under SHOPLINE admin panel > Delivery Options, we offer multiple delivery options such as local and overseas delivery, custom shipping options and more. After picking a suitable logistics option, merchants can set the delivery fee and name of the delivery option (what customers will see in checkout) and your customers can start selecting this option. A handy shipping option for both customers and your shop not only improves customer turnover and satisfaction, but it also speeds up the delivery process, making your purchasing process more efficient! We provide local logistics integrations such as SF Express and SF Plus. You can add more details to custom delivery options like face-to-face delivery, so customers can have a clear understanding on how it works. 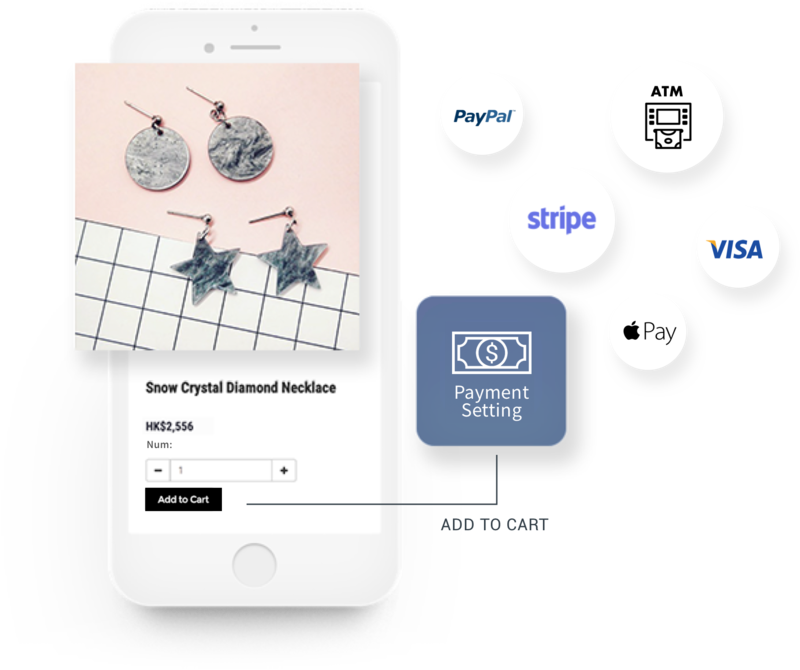 Payment options play a critical role in the customer journey of an online shop. Safe and secure payment options make sure that customers are paying directly for the items they purchase. SHOPLINE works with multiple local and overseas third-party payment service providers to offer safe and easy to use payment options and ensure smooth transactions between buyers and sellers. Under SHOPLINE admin panel > Payment Options, you can choose credit card, ATM transfer, mobile payment, or other custom options (e.g. cash-on-delivery). You can add more details to custom payment options like cash-on-delivery, so customers can have a clear understanding on how it works. SHOPLINE’s integration with Stripe makes payment even easier. In a 15-minute set up, VISA, MasterCard and Apple Pay are enabled for your customers so they can pick any payment method they like. Complete product information and easy browsing and searching are essential to attract customers to purchase your products. In SHOPLINE admin panel Products and Categories > My Products, you can add new products and set product pictures. You can add product information, price, quantity, variations, etc, and you can immediately preview in the product page. Then, in Categories, you can adjust the display order of all the products and assign categories. To finish things up, go to Menu Navigation and add shop pages, product categories, external links and other tabs to the menu. You can adjust the order and level of the items. After completing the above steps, your online shop is all set and ready to go! If you have quite a lot of products to upload, we also provide you an upload file in Excel format so you can do bulk upload more easily. You can also set reminders for pre-order items or products with low inventory. 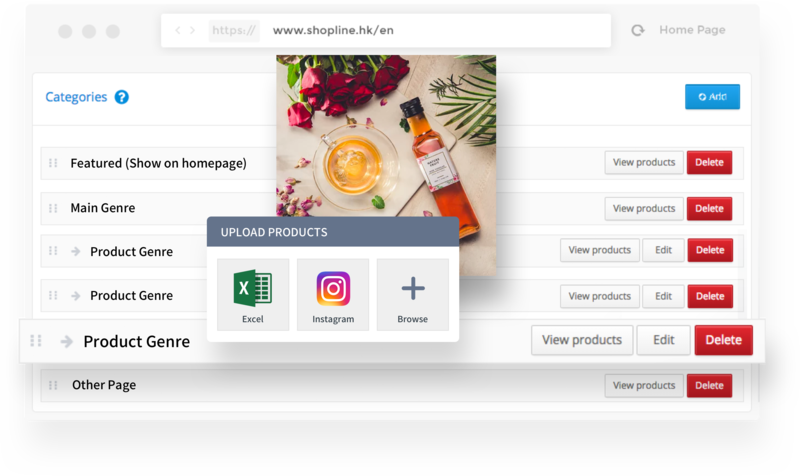 SHOPLINE’s integration with Instagram also allows you to import product pictures directly, and turn them into your Instagram shop products.